There is a reason Clorox Pine-Sol Brand Cleaner has been around since 1929. It works hard to keep your home clean. 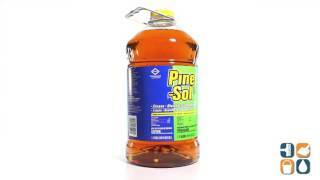 Pine-Sol rapidly cuts dirt and grease on hard surfaces, leaving behind a fresh, clean scent and no sticky residue. When used at full strength, the formula can be used as a disinfectant to kill bacteria and common germs on hard, nonporous surfaces. Will kill germs that cause Salmonella enterica, Staphylococcus aureus, Trichophyton mentagrophytes (Athlete’s Foot Fungus) and Influenza A virus (Hong Kong strain). 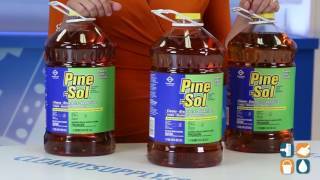 Pine-Sol cleans and deodorizes a wide variety of surfaces, including floors, sinks, counters, stoves, bathtubs, shower stalls, tile, toilets, garbage cans and diaper pails. In addition to all of this, Pine-Sol can be used to remove strong odors, grease, heavy stains and soils from clothing. Simply rub it on stains or add some to the machine before washing. 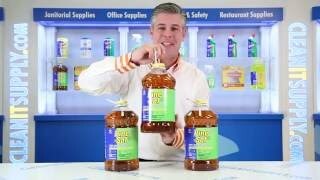 Cleaning Supplies for office and plant. Good cleaning agent -- leaves a clean, fresh smell.